The article mentions that the company uses Google Cloud to build services to monitor the status of hundreds of wind turbines and solar power plants in eight countries, and to monitor the health of wind turbines and solar panels through monitoring dashboards. At the same time, the service is requested in real time when maintenance is required. On the other hand, the author's team also uses the BigQuery service provided by Google Cloud to control the production of electricity through algorithms, which are directly related to revenue. Moreover, since both wind and solar energy are easy-to-consume resources and cannot be stored and sold, they need to be monitored 24 hours a day, and adjusted in real time according to the needs of the grid and the purchase of electricity by users. If the capacity is insufficient, it will be fined. In the early morning of June 28th, local time, the team received a notice from the monitoring service Uptime Robot, warning them to the wholewebsiteThe service has stalled. 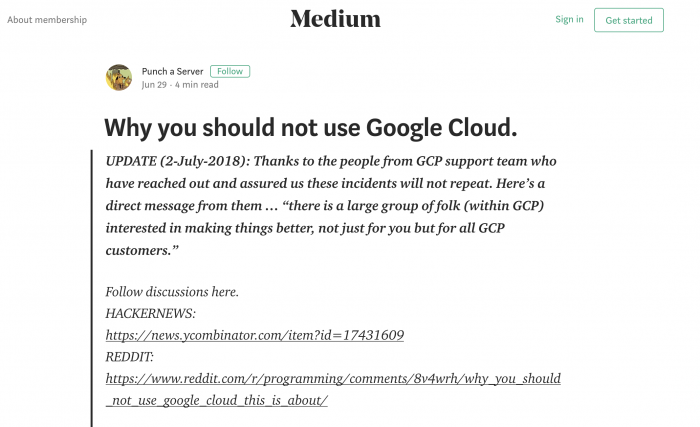 At the same time, the company received a message from Google that Google said that all of their activities were stopped, including stopping all of their activities, includingdatabase, site suspension, and Firebase permissions downgrade. After the incident, the team stated that there was no direct contact with Google’s channel and the online service system was also closed. Only receive an email asking the person in charge to fill out the amendment form to correct the suspicious behavior and upload a credit card, ID photo, otherwise the entire project will be deleted within 3 days. Fortunately, after the responsible person filled out the form urgently, Google resumed service for them after 20 minutes, but it still caused almost one hour of data gap. This incident caused a heated discussion among users on the forum. Most netizens thought that Google's practice of forcibly closing the service without prior warning was too strong, and some users said that even if they paid Google a high service fee, the quality of the service was still worrying. Prior to joining Google, Diana worked for Intel Corporation for 25 years, primarily responsible for the data center team, and then joined Google because of "family issues" leaving Intel. The appointment of Diana is also seen as a major victory for Google in the field of cloud computing. In the industry's view, Google is the third-ranked cloud computing service provider, compared to Amazon's AWS andMicrosoftAzure is still only a "latecomer", so Google needs to recruit industry leaders to expand their strength and prove themselves to companies. In May of this year, Google acquired the Israeli cloud computing company Velostrata. The company is committed to helping companies migrate operational data to Internet cloud service providers. Amazon AWS and Microsoft Azure have served as their target, but after being acquired by Google, Velostara may stop helping companies migrate data to Google. On the opponent's cloud computing platform, and the entire team will join Google. Who is the big winner in the cloud computing battle? Although Google is working hard to push Google Cloud to serve more businesses and deeper business levels, Google still lags behind Amazon AWS and Microsoft Azure when it comes to the trust and frequency of use of the enterprise. A few days ago, the head of Google Cloud said in an interview that Google is preparing to carry out various acquisitions in the right circumstances to catch up with Amazon and Microsoft's industry leadership in cloud services. In the past two years, Google has compressed many costly research projects, but it has continued to invest heavily in cloud service projects, which undoubtedly shows Google's emphasis on cloud computing. In January 2018, Google launched a new digital store that sells cloud computing software to businesses and other organizations to take advantage of industry leaders such as Amazon and Microsoft. In the face of the pursuit of "latecomers" such as Google, Amazon AWS, which is the first to enter the industry and has the highest user acceptance, has not slowed down, and still strives to innovate and maintain its leading position in the industry. AWS CEO said: When the time is right, AWS is expected to become the largest business within Amazon. Moreover, Amazon also strives to cooperate with various industry giants (such as Siemens), which also gives a strong guarantee in word of mouth. As a hot spot in recent years, major technology giants have attached great importance to cloud computing. In the fierce competition in the industry, regardless of domestic and foreign, the giants of science and technology are vying to develop cloud services "to spare no expense" and strive to improve their competitiveness and reputation. In the end, perhaps the winner of the cloud service does not seem to be so important. The enterprises and users who are the beneficiaries of the service can get better service and experience, which is the meaning of the cloud service itself.